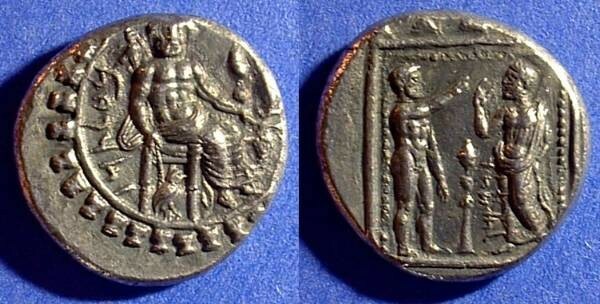 Obv: Baal enthroned facing holding an eagle tipped scepter, grain ear and grape bunch, aramaic legend "Baal Tarz" behind. The walls of the city of Tarsos around. Rev: Ana (the sky god) on the left standing naked and pointing his hand upward. Datames standing on the right with his hand raised in veneration. The aramaic legend "Tadnmu" = Datames in front. A thymiaterion is between them.